Many trains spend years out in the elements, are subjected to harsh weather conditions and even abuse- almost all real trains show signs of aging. Using simple weathering techniques you too can achieve realistic results, representing the long and hard service life of your model empire. 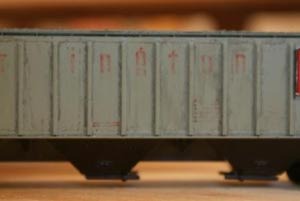 Weathering can take many forms including rust, grime, patched paint, faded letters to name just a few. There are almost as many ways to recreate the ravages of time and nature. Weathering can be intimidating, but it is not impossible. With practice, you’ll be adding years to your roster in no time. The techniques described here can be used individually or combined to create an endless variety of weathering patterns. This simple technique is great for beginners as the entire process can be easily reversed with a wet cloth. Easy to use as a marker, excellent results and completely reversible! 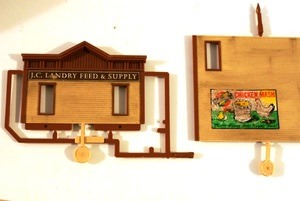 These are great for your first weathering project, or even to touch up your old weathering projects. After blending the colours and spots, the final results are as convincing as they are easy. 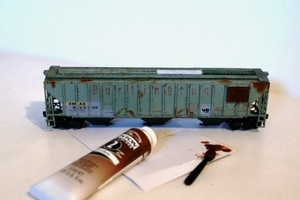 This simple technique uses a minimal amount of paint to create realistic streaks and scratches. Use oil paints and makeup sponges – yes makeup sponges – to create amazingly real rust spots. Realistic rust patches are made by dabbing oil paints on a model with makeup sponges. Create the look of peeling lettering with a little decal setting solution and an eraser. With a little more time and rubbing, you can remove the lettering all together. A simple watercolor wash can tone down the paint and make the details pop. When nearly dry, the wash is wiped off the car with a paper towel. By using a weathering wash, your models can immediately get that “aged” look – no more shiny plastic! Make a car look like it’s been out in the sun for a few years. 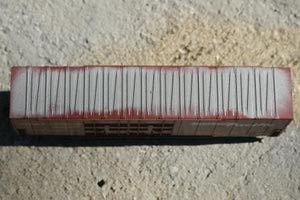 This basic airbrush technique is an easy introduction to weathering with this important tool. The reporting marks, road number and weight data are all applied with separate decals. 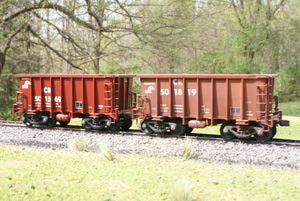 This model features a double-paint-out with its third owner simply patching over the reporting marks. 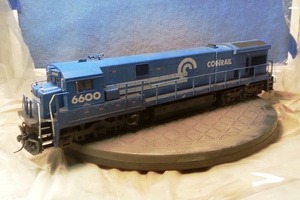 Railroads often paint-out certain sections of a car as opposed to repainting the entire thing. These patches may be the result of new owners, maintenance, or just to counter excessive weathering. Every car you do will be unique. 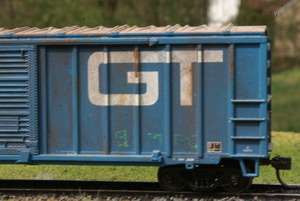 Railroads don’t paint the roofs of their boxcars nearly as often as modelers. Paint over spray from the sides is often seen around the edges however. 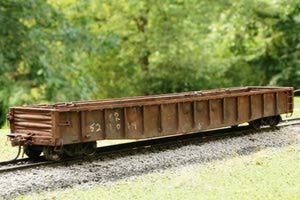 Since we spend so much time looking at the roofs of our cars, simple enhancements like this can add a lot to a boxcar fleet. Once you’ve learned this simple masking trick, you’ll probably think of more uses of it too! 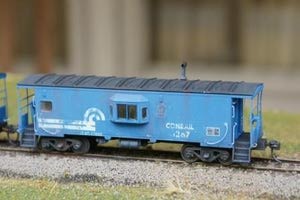 Age your decals prior to putting them on a model to create faded signs and lettering. Dented and bulging sides are just one part of the overall look on this gondola. The car was finished with oil paints, acrylics and chalks to represent a very well-used car. The faded decals are applied to the walls and carefully worked into the contours of the siding. This makes them appear to have been painted on the walls and weathered over the years. 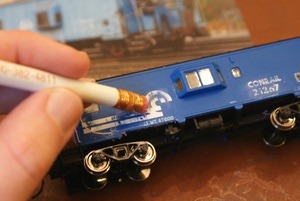 Use a soldering gun and screwdriver to add some distress to your models. Warning – this is an easy but advanced technique – non – reversible! 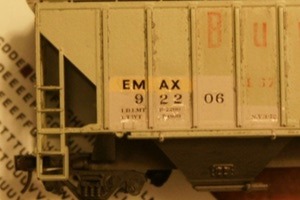 Proper weathering doesn’t obscure details, it enhances them. 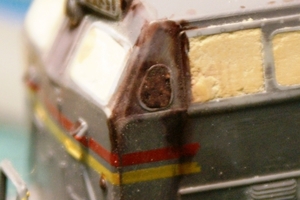 An airbrush is the easiest way to reproduce the often-subtle weathering effects found on the prototype.